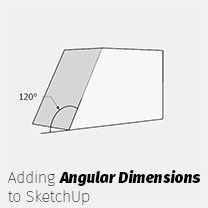 Ever struggled to add angular dimensions to your SketchUp models? Maybe your prepping your design drawings for LayOut and need to call attention to some important aspect of the build? Say hello to Angular Dimensions by Steve Baumgartner. 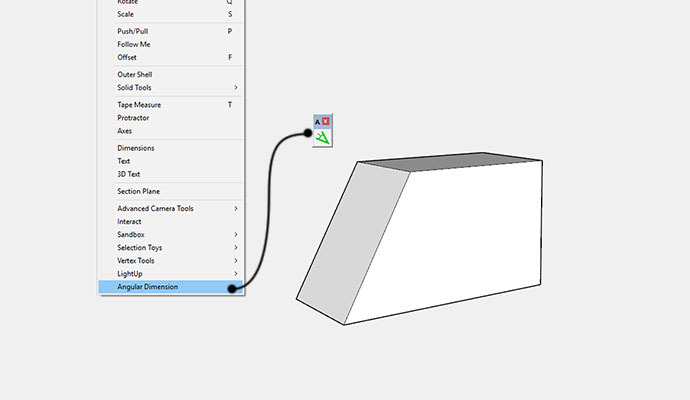 In this quick tip you will learn how to use Angular Dimensions to add inner and outer angular dimensions to your 3D models in SketchUp. Firstly you will need to install Angular Dimensions via the ExtensionStore. Once installed you can activate the tool via the toolbar icon or the Tools menu. Using Angular Dimensions could not be easier. Steve has really made it super simple to add dimensions. It has two modes, inner dimensioning and outer dimensioning, that you can toggle between these with the TAB key. To draw an angular dimension you pick the first end of the measured angle followed by an endpoint and finally the seconde measured angle. Angular Dimension places the callout, in a group, with some leader text. An added bonus is you can toggle the drawn dimension to be inner or outer with the TAB key. This is a very nice addition. And thanks for the animated tut. please how can i install it to programe skp2015 ? This is a useful tool. Thank you Steve Baumgartner. Now if only a tool to indicate radius dimensions could be developed?? Is there a way to force the angle measurement to revolve around a line between two planes? Firstly you will need to install Angular Dimensions via the ExtensionStore? Where do I find the extension store?